Yet another week has gone by, and it is time for ourStamptacular Sunday Challenge, this week our theme is "Fall-ing for you", which means having to create a project all about Love in fall colors... Actually, this was not a challenge at all for me: Fall is my favorite season, colors of fall are colors of my heart, and Love... Well, that's what life is all about, isn't it? 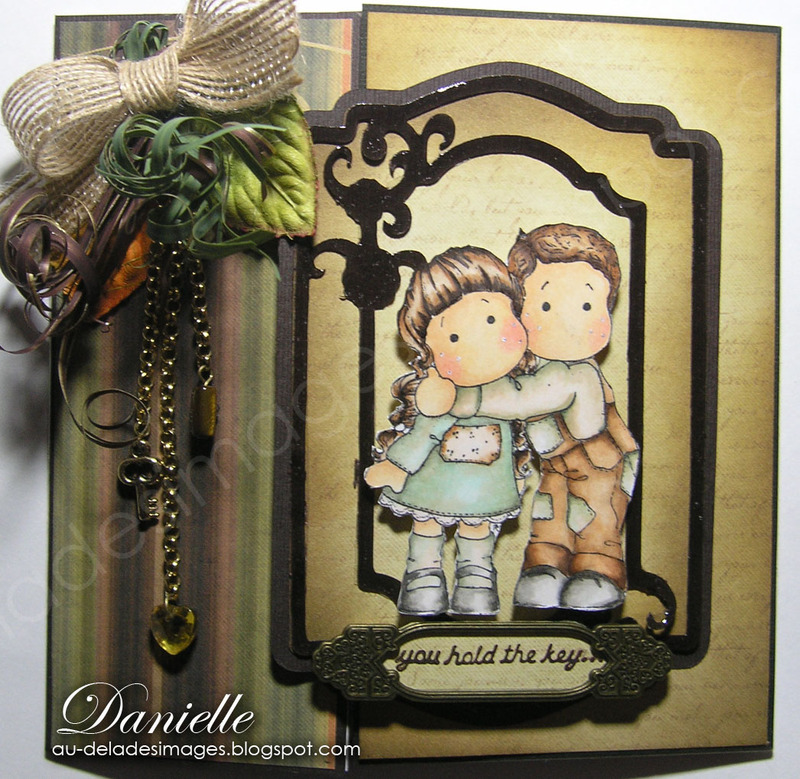 I knew right away I had to use this wonderful Magnolia Stamp, Brother and﻿ Sister, from the Cozy fall collection. 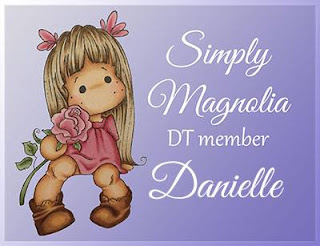 I don't see her right now at Magnolialicious, but I am sure Diana will make it available pretty soon. Back to my card, I chose this wonderful paper by Creative Memories (I forgot the name of the collection, since it is quite old), and inked it with Distress inks: Brushed Corduroy and Walnut Stain! I am walnutstaining every thing these days... I used Cricut Lacy labels cartrige to cut this cute window, I embossed the top pannel with Glossy Accent. The lovely jute ribbon is gift I received from a dear friend. I bought the little key charm and the cute frame in a Dollar Store! The bead and little stone heart are from my stash, as well as the chain, the nice fall leaves are from Prima. Tilda and Edwin are colored with Copics, on Cryogen White (love all the sparkles). Of course, you understood that Edwin and Tilda don't only hold on to each other, they hold the key to each other's heart! All those earthy soft and warm colors translate the love they have for each other... One can also imagine that the writing in background is a love letter... OK, OK, I am falling in a romance... OH! 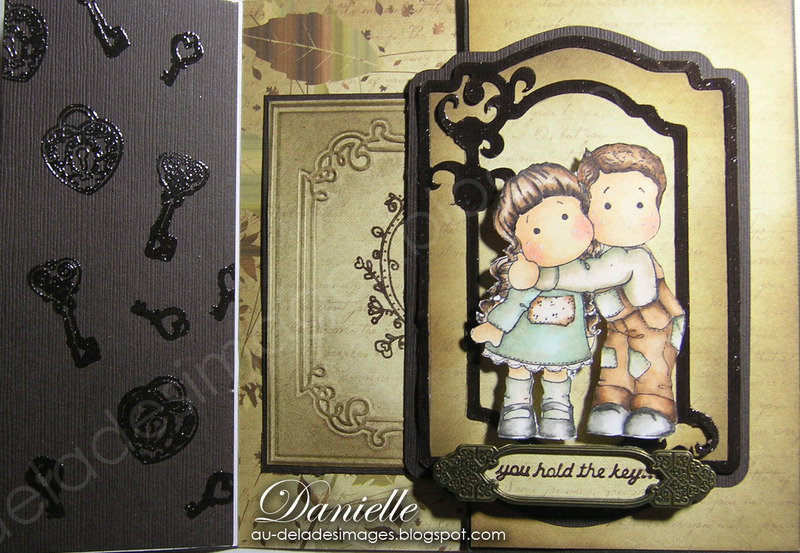 this theme is absolutely fantastic, it opens the door to imaginary romance... I can't wait to see what you will create. I thank you from the bottom of my heart to visit me, comment my work and encourage me to go on and discover/experience all kinds of techniques. It is the sharing that creates this magic. Ce thème est fantastique, et ouvre la porte à l'imaginaire, j'ai hâte de voir ce que vous allez créer. Merci de vos nombreuses visites, de vos commentaires merveilleux, qui me comblent et m'encouragent à me dépasser, à relever le défi. 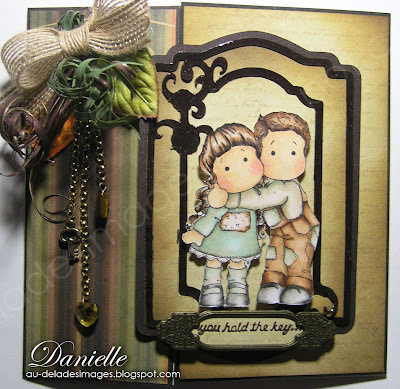 A beautiful card for a great theme, Tilda and Edwin showing how they love and care for each other. Great coloring. Dear Danielle, this is a work of art for sure!!!! Love the Cricut window and you colored those cuties to perfection. 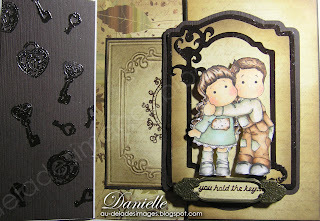 The details are stunning and help make this such a very special card. That has to be one of my favorites!!!! Could this card be any more beautiful?!? NO! It's just stunning! Danielle, this is totally gorgeous!! You ALWAYS inspire me with your work! Beautiful coloring and I love that frame! Awesome details too! Danielle, this is brilliant. I love the warmth of the colors and your coloring!!! Danni this is just stunning! The outside is absolutely gorgeous and I love your bow, leaves, and suspended charms. It's absolutely enchanting on the inside and so beautifully finished. Awesome work my friend. Tout à fait "stampaculaire"! Quoi dire de plus. Le décor, la colorisation et l'intérieur de la carte...tout est sublime! What a really beautiful card. I so appreciate your taking the time to inspire us with your work. Please continue bringing beauty into our world. Danielle Champagne just sounds French don't you think? You make such elegant cards - I guess it must be all that French Culture. The card is beautiful - and the work around Tilda and Edwin looks like basrelief- gorgeous. And the charms dangling down lead you right inside which is like a fairytale. Nice artwork. Wonderful card. so unique in its design. wow!! ta carte est magnifique et on voit très bien que tu es dans ta zone de confort, car tu t'en sort haut la main, un vrai petit trésor. Just one word tells the story, BRILLIANT. Your colouring is outstanding and the embellishments to the left of Tilda and Edwin are stunning. This is CardART at its finest. 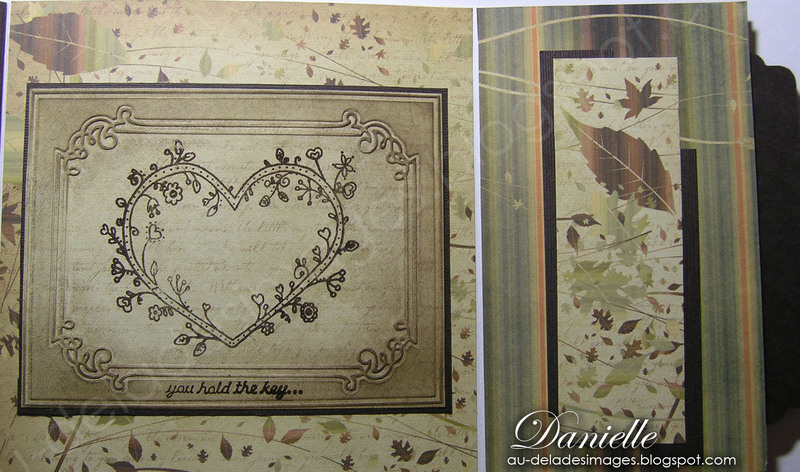 Beautiful job Danielle, I think one of your best. FABULOUS Danielle! Loving everything about it. Hoping you had a wonderful Thanksgiving. Dannie, my goodness girl, this is so fabulous so wonderful.. You have done a work of are.. I adore the first page with the beautiful colorful couple and the bow with the fall leaves and the inside is just as beautiful. 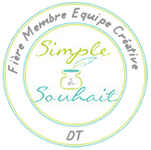 Une carte vraiment bien construite et spectaculaire comme tout ce que tu nous fait voir sur ton site! Félicitation! Wow Danielle, this is gorgeous. I love the lacy label you've used. I need to get that cartridge! So pretty! Oh my, this is so absolutely adorable! Love your coloring and I love those papers. gorgeous! wow, Danielle! Que c'est beau!!! 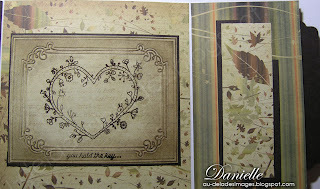 Très belle colorisation, beaux papiers et belles embellissements! Sublime! Gros bisous et passe une belle journée! MAGNIFIQUE! J'aime tout, tout, tout!!! Tout est sublime et bien pensé! Des délices pour les yeux.... je manque de mots pour tout décrire! L'idée des breloques est géniale!